Building on evidence that Apple is seeking to hire engineers to test new Macs with 3G Wireless WAN support, people familiar with the company's plans say Mac OS X 10.6 Snow Leopard will incorporate new support for native WWAN hardware. These people report that the new version of the System Profiler application provided in Snow Leopard developer builds includes WWAN reporting under its network information section, shown in the artist's conception below. System Profiler is used to compile hardware information; if Apple were only reporting information on third party USB 3G WWAN peripherals, something that Mac OS X already supports, those reports would continue to be included with other USB devices. Instead, Snow Leopard's System Profiler breaks out WWAN support on the same level as other technologies that are available from Apple, directly built into Mac hardware models, including the ubiquitous Bluetooth and AirPort as well as hardware interfaces that are only available on specific Mac models, such as the Fibre Channel and SAS of the Xserve and Mac Pro. Last year, Apple CEO Steve Jobs told USA Today that Apple explored the idea of building a 3G chip into the 13-inch MacBook Air, but said he ultimately decided against the move because he doesn't want MacBooks to be tied to a specific wireless carrier for enhanced internet services. In the year since, global economic troubles have forced new pressures on PC retail prices and have helped make netbooks popular, albeit not necessarily profitable for hardware manufacturers. Netbooks are low cost mini-notebooks that are often subsidized by mobile service contracts. Apple has shown no interest in entering the netbook hardware category, but has been wildly successful in marketing the iPhone with a mandatory voice and data contract that enables the company to offer the ~ $600 device for just $200 with a contract. The likelihood of Apple following the same strategy to offer Macs to consumers at a subsidized entry prices surfaced earlier this year when it was reported that Orange's UK division was wrapping up talks with Apple to offer subsidized MacBooks to customers who sign up for its top-rated 3G service. At the time, Orange was said to be testing its USB dongle modems with the current line of MacBooks, suggesting the deal had little to do with any plan on Apple's part to build wireless broadband chips directly into its notebooks. Speculation that Apple may separately be planning to tie 3G chips into its future notebook designs received a shot in the arm this week when it was discovered that the company's Mac Hardware Group was actively seeking to hire a position responsible for "testing and reporting hardware, software, and device driver bugs for Communications technologies including AirPort (802.11a/b/g/n), Bluetooth v2.0, gigabit Ethernet, and/or 3G Wireless WAN in a detailed, timely manner." For whatever reason, Apple plucked the job listing from its website following media reports on the matter, which could be seen as a sign that the listing was a bit too revealing of some actual plans by the company to move towards embedded 3G hardware in its Mac line. However, the Mac maker has been actively seeking someone to fill the position for more than 3 months and made no effort to remove at least 4 similar copies (1, 2, 3, 4) of the same job listing, which could still apply to evaluation of dongle devices rather than native hardware. 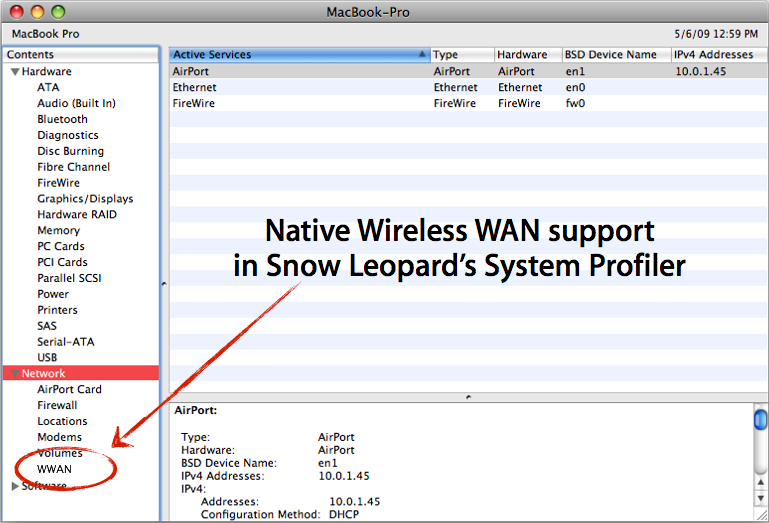 Still, the fact that WWAN support is being included in System Profiler of Mac OS X 10.6 Snow Leopard may provide the most concrete evidence yet that the 3G Wireless WAN support Apple is reportedly testing could arrive as early as Snow Leopard, which is expected to publicly debut at WWDC and become available to users shortly afterward. That said, all of the evidence pointing to native 3G hardware turning up in versions of Mac notebooks this year remains fairly anecdotal.